Thought I would finally contribute, now that I have had *some* success with growing emersed. This is my "second attempt" for this particular setup, after initially dealing with a fungus gnat, and fungus problem that seemed to halt growth entirely. The Monte Carlo was grown from a single pathetic sprig I found stowed away in the root system of another plant, somehow it survived. 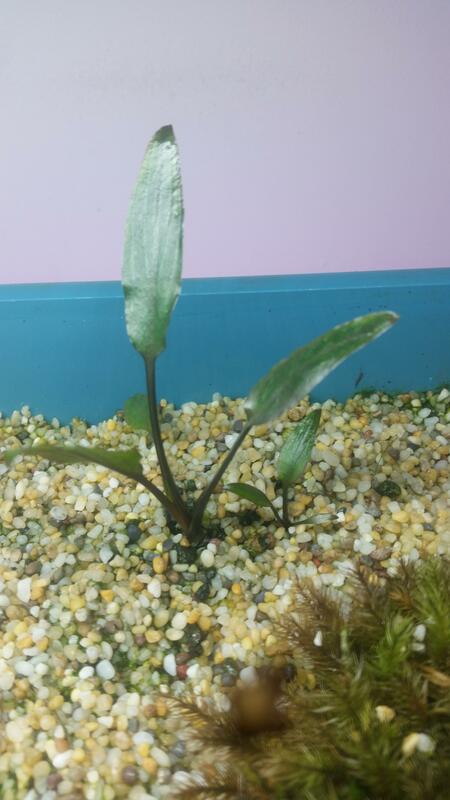 Hoping to increase my "collection" of Cryptocoryne species at some point, all of which I have Cryptocorynus to thank for - C. Crispatula, Crispatula var. Balansae, Wendtii "Green", and Beckettii. Couldn't figure out how to resize each image, hahaha. Looking good! That light is looking super powerful tho! Hope you have dimmed it. Whats your garage temperatures like? Emersed bug can bite you hard! It's not dimmed actually haha. But it hasn't caused an issue so far, and I seem to have really good colouration as a result - with the "Super Red Mini" and Alternanthera Reineckii at least. I wanted to try something different, the top setup is what I tried first but that was mostly a failure. It doesn't seem to drop below ~22°C from what I have observed, I have a heating pad underneath it. I should have kept each plant potted individually, but I don't mind this look either. Looks great. The 'Super Red Mini' carpeting like that is something I haven't really seen before (mine is currently very spindly and erect). Crypts looks very nice too, good to see they're happy and going well! Now have species such as Spiralis, Pontederiifolia, Cordata var. Siamensis 'Blassii', Lutea/Walkeri 'Hobbit', Wendtii 'Flamingo', Wendtii 'Tropica' and a few other odds and ends. Finally got a Lagenandra Meeboldii that i've wanted for forever. Bottom setup has remained the same, more or less. Also have a microscopic C. Regina/'Silver Queen' that is thus far growing and looking promising, as well as a not-so-good looking C. Aura that has been proving difficult, being my first blackwater species. Really nice indeed! Love this setup. Love it Kennett Feeling inspired to try emersed as well. If anyone is interested, they have some nice semi opaque containers in Bunnings that are suitable for indoor emersed projects. They could be stacked as well. I have done a simple DIY light for these that I will be documenting soonish. Great indoor winter project. That they do. Unfortunately there doesn't seem to be any that are especially tall, for the larger species such as Ciliata. I've thought about stacking mine but it's a real pain if you need to access the lower ones. If you have an interest in growing aquarium plants, go for it. I found potting soil to be a disaster due to not being able to sterilise it. I had a fungus gnat outbreak which seemed to halt growth before decimating everything. I had a similar experience when I moved on to Bunnings coconut coir on top of expanded clay balls separated with flyscreen. 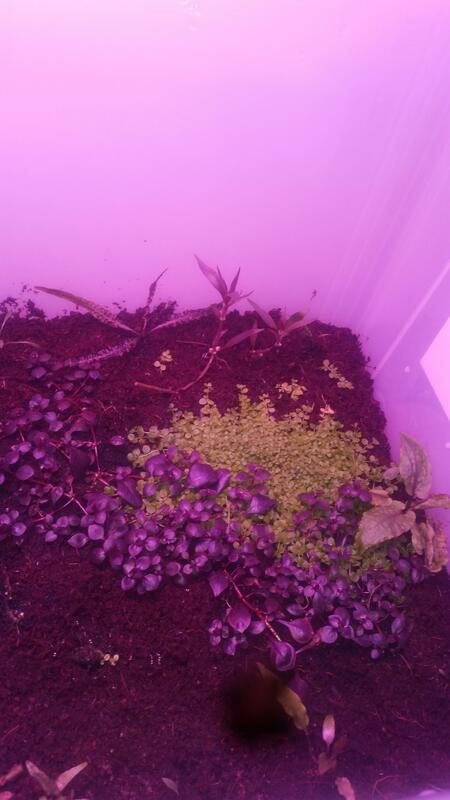 It wasn't until I swapped it out for a hydroponics coconut coir that I really had success. I have more Alternanthera Reineckii and Monte Carlo than I know what to do with. A few more I obtained this afternoon. In order, C. 'Pigmea', which is said to be a "pygmy" or dwarf cultivar of C. × Willisii from what I have researched online. C. × Purpurea, which could very well be Dennerle's × Purpurea which is allegedly just a Cordata. Time will tell, I guess. C. Ciliata, i'm hoping it's var. Latifolia and not var. Ciliata. I won't know for sure unless I end up with a spathe of course, that's assuming they pull through. Last photo is a Fissidens spp. I found locally growing semi and completely submersed which I hope to propagate in each setup. Thought i'd throw up a few more photos..
Three different Spiralis, two of which are var. Spiralis. Some out of control Beckettii and Wendtii 'Tropica' I had to palm off. Some random Anubias etc. Keep up the good work and update often! Yep.. Especially Cryptocoryne, i'm hooked. I'm at about ~33 varieties, but there's still so many I don't have. The trouble is keeping a good amount, the Wendtii I have get out of hand quick. I have a few locally collected Fissidens as well, but stem species are basically out of the question due to how much space they demand. I still have far too much Monte Carlo haha. If you are keeping crypts, Grubs and Cryptocorynus on the forum both collect with precise names etc. Yeah, I would say Cryptocorynus is a friend - a ripper of a bloke haha, that's where I got a lot of what I have. I know Grubs has species I don't have, and vice versa hahaha.